Yesterday I was in a baking sort of a mood! I wanted to make a tres leches cake from scratch and then my idea ended up evolving into something a little different! I used an old fashioned white cake recipe that was given to my Momma years ago by a neighbor and it is seriously a never fail recipe! I "threw" in a little sweetened condensed milk, evaporated milk, white chocolate pudding and toasted coconut and viola! The flavors came together beautifully! Our buddies M and B brought dinner over last night YUM! And then my fam came over and we all enjoyed a laid back Sunday evening! We were all anxious to try the coconut cream cake yesterday evening so it wasn't chilled to my complete liking but still very tasty! Well, this morning I came downstairs and decided to indulge for breakfast and oh man! I wish everybody who tasted this cake last night would come back over to taste it fully chilled! 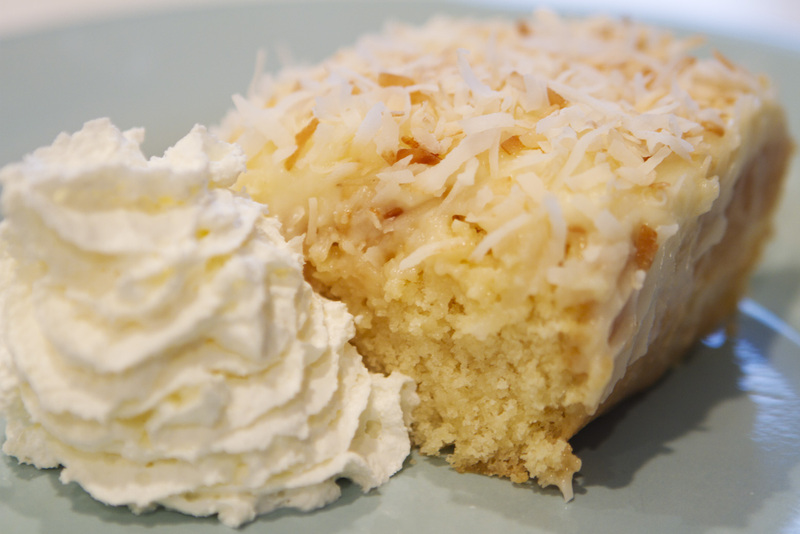 It really is just like a coconut cream pie, only in moist cake form! Enjoy! Pam or crisco and flour a 9 by 13 inch baking dish. Pour finished cake batter into your prepared 9 by 13 in pan and into the oven for 30-40 minutes until top of cake is no longer jiggling but firm! Okay, so I know this cake recipe seems a little backwards and instinctually you would want to cream your sugars and fats, then add the liquids and add the dry ingredients last! And here is a little factoid for ya! Doing things in the order I have just mentioned above is called a basic muffin method! If you ever don't have a set of instructions to go a long with a recipe, whether it's a cookie, muffin, quick bread, brownie, cake, etc, you can generally follow the the muffin method and your finished recipe should turn out great! Now, throw what I just told you out the window for a minute and follow the recipe above the way it is written! Amazingly, it will turn out beautifully! Once your beautiful and golden baked cake is out of the oven, poke holes with a toothpick or skewer every inch or so and pour 1 (14 oz) can of sweetened condensed milk over the top. Use a rubber spatula to spread evenly and make sure the condensed milk seeps down into all of the holes! Then, take 1/4-1/2 cup (depending on how moist you want the cake. I used a 1/4 cup but next time I would use a 1/2 cup) of evaporated milk and with a pastry brush, brush evenly over the cake. I used a pastry brush to keep it consistent, not wanting too much evaporated milk to seep into one area and not enough in another! I hope this is making sense! Next cover the cake with foil and put it in the fridge to chill for a few hours. In a teflon coated saucepan, over medium heat, toast 1 1/2 cups of sweetened, shredded coconut to a golden color stirring constantly. Set aside to cool! Once your cake has chilled a few hours, prepare a small box of JELL-O white chocolate pudding according to the pudding(not pie) directions on the box. Take your cake out of the fridge and spread the prepared white chocolate pudding evenly, like a frosting over the cake. 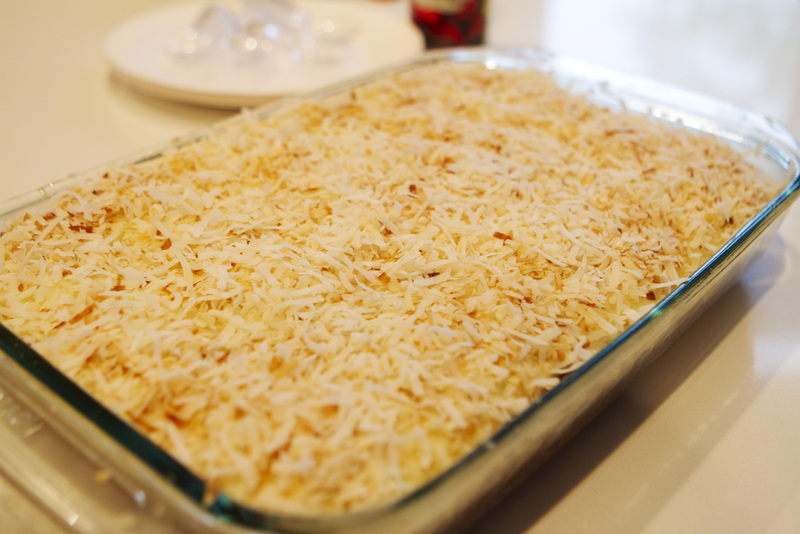 Then sprinkle and pack the cooled toasted coconut on the top! Serve immediately or put back in the fridge until ready to serve! Refrigerate any leftovers! These instructions may seem lengthy but don't let it intimidate you. The process is super easy, I just wanted to be thorough in my instructions! Look at this little delight! Whoa, this looks decadent. I love a good moist cake! And I love coconut, so I will for sure be trying this one. Om my this sounds delicious!